I do research in human-computer interaction (HCI), with a focus on visualization. HCI is a field which, I feel, combines the excitement of active and creative engagement with computers, along with much potential for novel and significant contributions from new practitioners. I especially love the idea of using the computer as a laboratory for visual and interactive experiments. Alexandre Millette, Michael J. McGuffin (2016). DualCAD: Integrating Augmented Reality with a Desktop GUI and Smartphone Interaction. Poster presentation at International Symposium on Mixed and Augmented Reality (ISMAR) 2016. 6 page extended abstract. Houssem-Eddine Gueziri, Michael J. McGuffin, Catherine Laporte (2016). A generalized graph reduction framework for interactive segmentation of large images. Computer Vision and Image Understanding, doi:10.1016/j.cviu.2016.05.009 (14 pages). Lili Li, Nancy Hamel, Kristi Baker, Michael J. McGuffin, Martin Couillard, et al. (2015). A homozygous PMS2 founder mutation with an attenuated constitutional mismatch repair deficiency phenotype. Journal of Medical Genetics. 5 pages (plus a 35 page supplement). Houssem-Eddine Gueziri, Michael J. McGuffin, Catherine Laporte (2015). User-guided graph reduction for fast image segmentation. IEEE International Conference on Image Processing (ICIP), pages 286-290. (5 pages). Houssem-Eddine Gueziri, Michael J. McGuffin, Catherine Laporte (2014). Visualizing positional uncertainty in freehand 3D ultrasound. Proc. Society of Photo-Optical Instrumentation Engineers (SPIE), Medical Imaging 2014: Image-Guided Procedures, Robotic Interventions, and Modeling, Vol. 9036, 90361H, 2014 (9 pages). Maxime Dumas, Michael J. McGuffin, Victoria L. Lemieux (2014). Financevis.net : A Visual Survey of Financial Data Visualizations. Poster presentation at IEEE InfoVis 2014. 2 page extended abstract. Click on the CC button in the youtube player for closed captions. Some really nice follow-up work by others: Domino by Gratzl et al., 2014. François Cabrol, Michael J. McGuffin, Marlon Schumacher, Marcelo M. Wanderley (2013). GenSession: a Flexible Zoomable User Interface for Melody Generation. Proceedings of Computer Music Multidisciplinary Research (CMMR) 2013, pages ?-? (12 pages). Maxime Dumas, Jean-Marc Robert, Michael J. McGuffin (2012). AlertWheel: Radial Bipartite Graph Visualization Applied to Intrusion Detection System Alerts. IEEE Network, Special Issue on Network Visualization, Vol. 26, No. 6, 2012, pages 12-18 (7 pages). Michael J. McGuffin (2012). Simple Algorithms for Network Visualization: A Tutorial. Tsinghua Science and Technology (Special Issue on Visualization and Computer Graphics), Vol. 17, No. 4, 2012, pages 383-398 (16 pages). Summary: Presents a hybrid visualization of compound graphs (also called clustered graphs) that combines approaches in MatLink, NodeTrix, and Lattix. Michael J. McGuffin, Jean-Marc Robert (2010). Quantifying the Space-Efficiency of 2D Graphical Representations of Trees. Information Visualization (IVS), Vol. 9, No. 2, 2010, pages 115-140 (26 pages), Sage Publishing (formerly Palgrave Macmillan). Summary: This article performs the first rigorous analysis and comparison of the space-efficiency of most of the basic tree representation styles in the information visualization literature. Some of the key ideas involved are (1) the use of a metric of the size of the smallest nodes (i.e. the leaf nodes) in the representation, in addition to a metric of total area; (2) analyzing the area of labels on the nodes, which implicitly takes into account both the size and aspect ratio of the nodes, measuring how much "useful" area they contain; and (3) analyzing how these metrics behave asymptotically, as the tree grows arbitrarily deep. The article also introduces a novel metric related to space-efficiency, and a set of design guidelines, and a few novel tree representations, including a variation on squarified treemaps (called rectified treemaps) that allows for larger labels within the nodes. Quote from one reviewer: "This is an excellent paper that rigorously addresses an important issue [...] The presentation is [...] of high quality throughout. I quite enjoyed reading this paper." Note that only the official copy is typeset according to the publisher's format. However, the unofficial copy made available here contains higher-resolution images. Summary: Describes the NAViGaTOR software package for visualizing and analyzing biological networks. See also http://ophid.utoronto.ca/navigator/ to download the software. Michael J. McGuffin, Igor Jurisica (2009). Interaction Techniques for Selecting and Manipulating Subgraphs in Network Visualizations. IEEE Transactions on Visualization and Computer Graphics (TVCG), Vol. 15, No. 6, November/December 2009, pages 937-944 (8 pages). [Journal article accepted after a 2-round review process, and presented at IEEE Information Visualization Conference (InfoVis) 2009. Acceptance rate: 37/141 or 26%. Cited over 100 times according to scholar.google (accessed May 2012). Summary: Proposes a hybrid graphical representation that combines node-link and adjacency matrix diagrams for the purposes of graph visualization. A prototype system is implemented to experiment with this idea. Techniques for smoothly animating between node-link and adjacency matrix representations are also considered. Quote from Ben Shneiderman, who was in the audience during the presentation at InfoVis: "Incroyable [...] Bravo! [standing and applauding briefly at the end of the presentation]"
Michael J. McGuffin (2006). 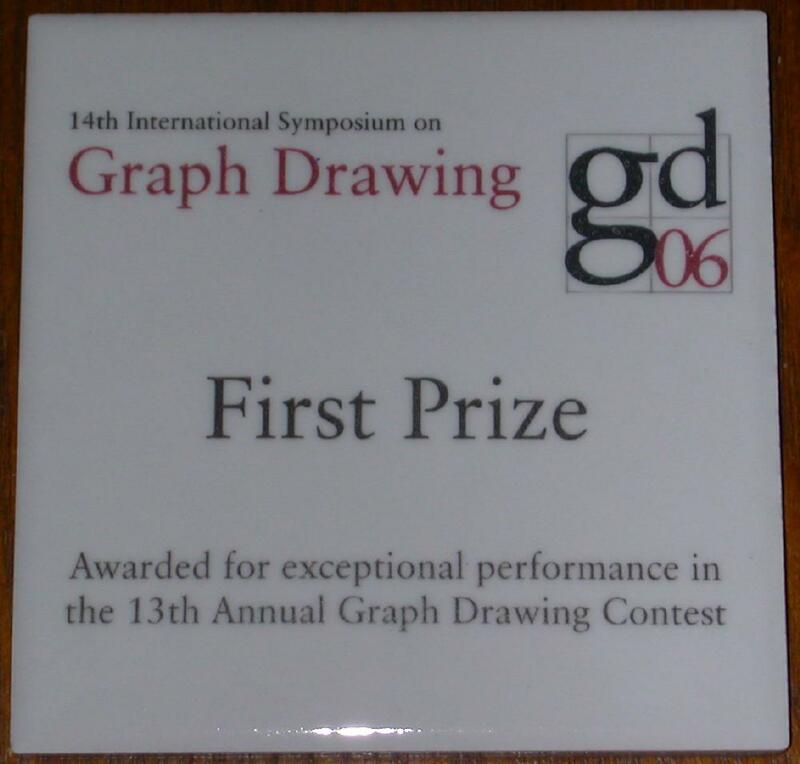 Winning entry to the Contest of the International Symposium on Graph Drawing (GD) 2006, in the Theoretical Graph Competition category. Michael J. McGuffin, Ravin Balakrishnan (2005). Fitts' Law and Expanding Targets: Experimental Studies and Designs for User Interfaces. ACM Transactions on Computer-Human Interaction (TOCHI), Vol. 12, No. 4, December 2005, pages 388-422 (35 pages). Summary: Builds on McGuffin's master's thesis, differing in the following respects: The article contains (1) a broader and more up-to-date survey of related literature; (2) a more systematically organized comparison and discussion of techniques, including techniques for facilitating target selection that don't use expansion; (3) a more general analysis than that given in section 4.3.2 of McGuffin's master's thesis, that derives a bound on the performance benefit of expansion in tiled targets (an extreme case where targets completely cover the user's input space) in terms of the accuracy of a target selection prediction algorithm; and (4) experimental data suggesting that, unfortunately, using cursor trajectory extrapolation for prediction, it may be very difficult to achieve accuracy high enough to yield a measurable performance benefit. In other words, attempts to use expansion to reduce acquisition time of tiled targets may be doomed (although expansion has other benefits, and does reduce acquisition time in other cases). The article also omits material from McGuffin's master's thesis, such as the thought experiments and the "Integrated Index of Difficulty" (IID). Summary: Considers hybrid graphical representations that combine node-link and treemap diagrams for the purposes of tree visualization. A theoretical analysis yields a taxonomy of various potential hybrid combinations, and a prototype system is implemented to experiment with these. Although the prototype does support some animated transitions, performance problems during the capturing of the video resulted in these animations not being very apparent in the video. Summary: A graph theoretic analysis of genealogical graphs (or "family trees", as they're commonly called) reveals why these graphs are difficult to draw. This motivates some novel graphical representations, including one based on a "dual-tree", or combination of two trees. Also described is a novel interaction technique for collapsing/expanding subtrees to any depth with a single mouse drag. Quote from one reviewer: "this paper [is] a nice clean solution for a generally misunderstood problem. Yes - the general usage of 'family tree' for this kind of graph is pervasive and actively misleading, I'm delighted that this paper will be an excellent citation to clear this point up. The use of both layout and interaction to solve a graph drawing problem makes this a central infovis topic." Animations in the prototype are smoother than they appear in the movie, due to the low frame rate of the movie. Summary: Expand-ahead is a space-filling technique by which some nodes of a tree are automatically expanded to fill available screen space. This reveals more of the tree to the user, and allows the user to drill down the path to a leaf node in fewer clicks, by skipping over the levels that have been expanded for them. Quote from one reviewer: "navigation is tightly coupled with visualization"
While running the demo program, use the up and down arrow keys on your keyboard to change the font size interactively. A README file is included with more details on how to operate the demo. Michael J. McGuffin, m. c. schraefel (2004). A Comparison of Hyperstructures: Zzstructures, mSpaces, and Polyarchies. Proceedings of 15th ACM Conference on Hypertext and Hypermedia (HT) 2004, pages 153-162 (10 pages). [Acceptance rate: 24/104 or 23%. Scored a unanimous, perfect 5/5 from all 5 reviewers. Nominated for Best Paper award. Summary: Builds on McGuffin's unpublished webpage "A Graph-Theoretic Introduction to Ted Nelson's Zzstructures" by considering, in addition to zzstructures, a graph structure associated with schraefel's mSpace. Readers may find section 3 to be a good first, though necessarily incomplete, introduction to zzstructures. Cited over 20 times in 2004-2005. Cited over 100 times according to scholar.google (accessed December 2011). Summary: Describes new browsing techniques for volume data. Key aspects include (i) using rigid and non-rigid deformations for browsing, allowing the user to "peer inside" data without losing surrounding context, and (ii) sensitivity to the semantic layers (or subsets) within the data, and designing interaction techniques around these. Deformations implemented include hinging, spreading, expanding, leafing, fanning, flipping, and peeling. If you're interested in more recent related work, especially with nicer rendering, check out work by Carlos Correa and the book Real-Time Volume Graphics by Engel et al. Summary: Describes a pop-up slider interaction technique, called FaST Slider, for selecting and adjusting continuous values in a fast, transient way. Once a FaST Slider is invoked, the user can either (1) drag length-wise to adjust the slider's value, and then release to quickly dismiss the slider, or (2) drag perpendicular to the slider to "post" it (like a tear-off menu) allowing additional controls to be accessed for fine tuning. Cited over 30 times in 2003-2005. Cited over 160 times according to scholar.google (accessed December 2011). Summary: Describes two studies that demonstrate the advantage afforded by expanding targets. The advantage was found to be approximately as large as one could possibly expect, given Fitts' Law. Also described are some initial attempts to incorporate expanding targets into a prototype interface. Michael John McGuffin (2007). An Investigation of Issues and Techniques in Highly Interactive Computational Visualization. Doctor of Philosophy (Ph.D.) Thesis. Department of Computer Science, University of Toronto, Toronto, Ontario, Canada. Summary: Builds on the three pieces of work published by McGuffin and his co-authors at VIS 2003, InfoVis 2004, and InfoVis 2005 respectively, by presenting the three pieces of work as case studies sharing a common set of high-level design goals, by analyzing and comparing the issues encountered in the case studies, by developing a 6-dimensional taxonomy of parameters that can be interactively manipulated in a visualization, and by proposing a dozen design guidelines for future work. Michael John McGuffin (2002). Fitts' Law and Expanding Targets: An Experimental Study, and Applications to User Interface Design. Master of Science (M.Sc.) Thesis. Department of Computer Science, University of Toronto, Toronto, Ontario, Canada. Summary: Builds on work published by McGuffin and Balakrishnan at CHI 2002, paying more atttention to design considerations for multiple expanding targets, and introducing the notion of an "Integrated Index of Difficulty" (IID). Chapter 2 also contains some novel thought experiments designed to deepen the reader's intuition for Fitts' law.